Villa Mälargården is located 600 meters from Happy Tammsvik and offers meetings and accommodation in exclusive privacy for up to 30 people. Only one group at the time is welcomed here. Your meals are cooked by your own chef and can be enjoyed in the rustic kitchen. In total there are 16 hotel rooms. Here no one can interrupt, there are no ringing phones, no running in the corridors. Here you have your own warmth outdoor pool, jacuzzi, sauna, gym, a salon with both a library and billiards room. You can also have your own activities such as cooking your own dinner guided by your own chef. There are 16 rooms in different styles; 13 doubble rooms, two suites and one single room. In all rooms you find hair and skin products from MALIN & GOETZ. Bathrobe and slippers are provided in your room, which can be nice to have when you go to the pool, the sauna or when you go down to eat breakfast. The morning newspaper can be found at the breakfast table in the kitchen where our guests like to stay for an extra time and enjoy the breakfast buffet. Here is free wifi connection throughout the house. The perfect conference room for the smaller group who really wants to hang out and shield their everyday lives. 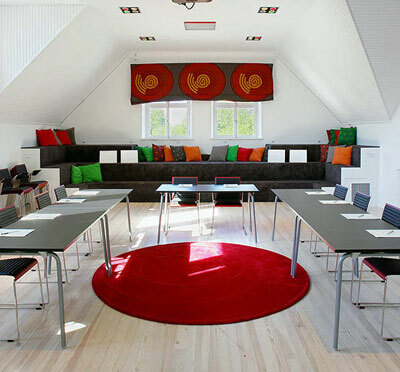 The conference room Möjligheten has a capacity for up to 30 people and is fully equipped with the latest technique and free Wifi. There are also two smaller meeting rooms in the house. The temperate outdoor swimming pool is at your disposal all year around. During the summer time the pool terrace is also a lovely place to enjoy great barbecue evenings and it is a great place for some more informal meetings. Here perhaps the most creative ideas are born. When the spring sun is blazing, the birds are chirping; the senses open up and the brain and heart interact like never before. There are two saunas in the house; one in the cellar besides the relaxation area, and the other one on the top floor of the villa. There you also find a massage pool indoors. There is a gym in the cellar. It is equipped with equipped with dumbbells, treadmill, exercise bikes and boxing bags. Adjacent to the gym you will find the relaxation area where there are well-chilled drinks to extinguish the thirst. Villa Mälargården is located in Bro, just northern of Stockholm and 40 minutes from Arlanda. 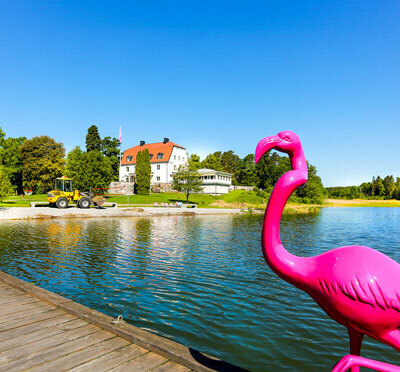 Have you been to Villa Mälargården and want to give your own comments?